Tuna loin canapés with tapenade. Two or three days before, cover the salted cod with water and reserve in the fridge. Do not forget to change the water at least once a day. On the day: drain and rinse the fish. Cook the peeled potatoes in a steamer until soft. Boil the fish into a pan with thyme and bay leaf. Cook for 15 to 20 minutes on low heat. You can also cut the potatoes and cook them with the fish in the same pan. Drain and let it cool, then take the fish skin off and with your fingers, push the soft flesh of the fish away from the central bone. Taking care to remove any little ones. There are only a few. Discard the bones. Put the flesh, the potatoes and the yolks into a food processor and blend roughly but thoroughly. Add the parsley, chilli paste and crushed garlic. Mix well. Prepare the oil in a deep fat fryer or a wok and shape the dough in dumpling form with a spoon. Fry each in oil, on both sides, until brown. Drain and serve warm with a chilled white Sancerre or Chablis. It’s the end of the week end! Relax and enjoy- Better: invite neighbours to share as we did last Sunday! “Tapar” in Spanish means “plugging a hole” and that’s exactly what I need on Sunday nights! Easy,relaxed, fun finger food. 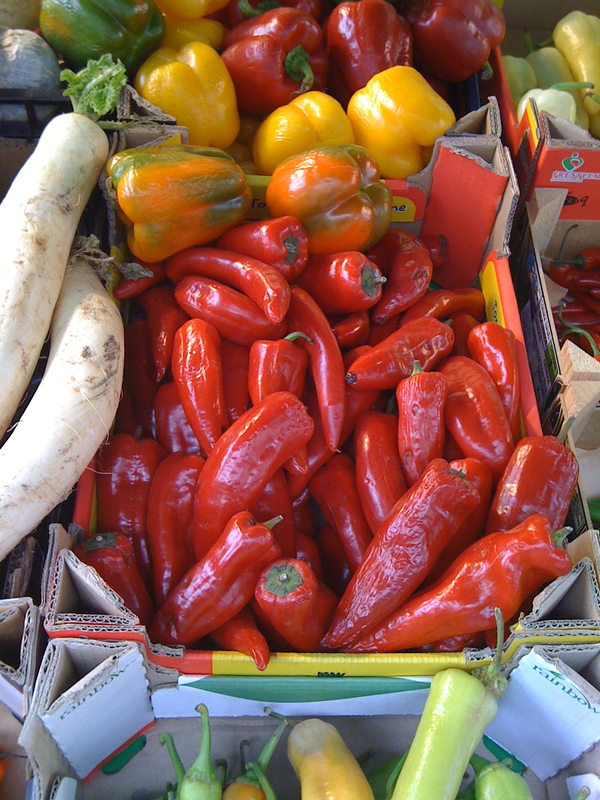 Market colours to inspire a menu! The nice twist of this recipe is in the big, fresh scallops and the variety of smoked and un-smoked fish. Boil the potatoes in salted water until soft then drain and reserve. You can do that in advance. I did it in the morning while getting up last week-end, then I was ready to go for a walk before lunch. Fry the onion in a bit of oil then add the cold milk in which you have dissolved the corn-flour. Turn on low heat until the sauce thickens. Add the grated cheese and season well with pepper. Clean the fillets and remove the skin if necessary then chop them all in big chunks. 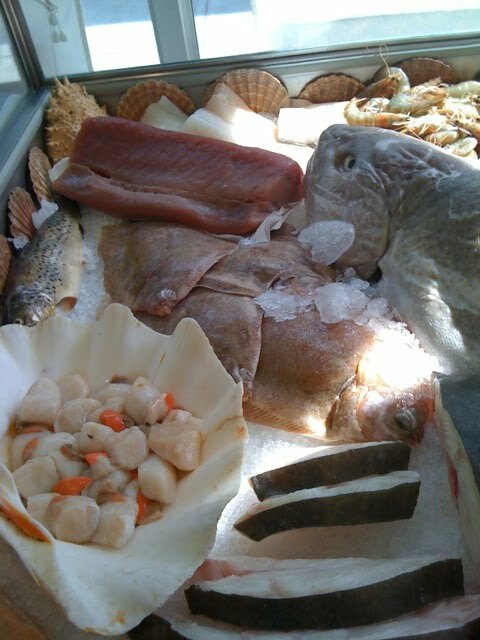 Lay the fish, scallops and prawns inside a baking dish. Pour the sauce over it. 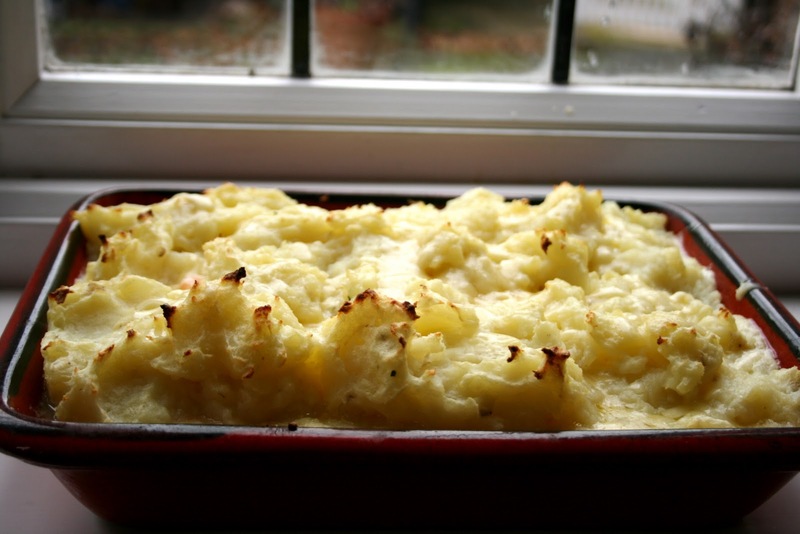 Take the potatoes and mash them with a generous amount of butter and milk. 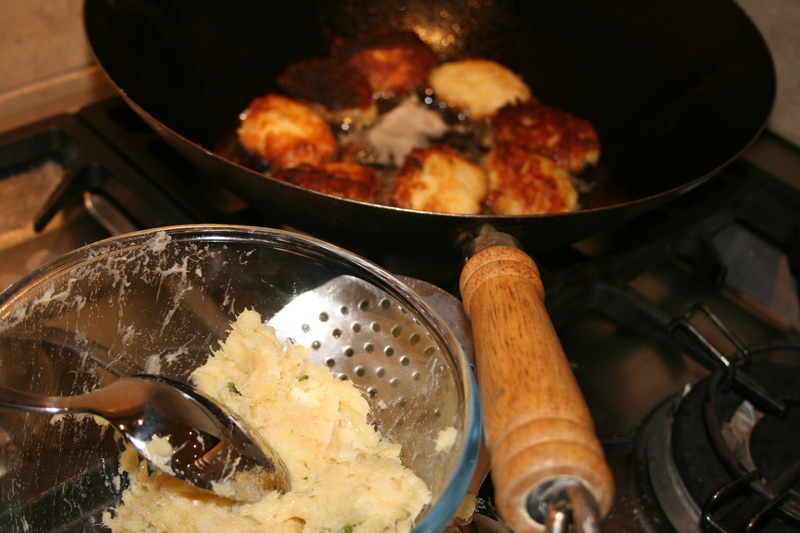 Place dollops of potato mash over the fish until most of it is covered. Bake in a very hot oven for 15 min. Then sprinkle with grated cheese, drizzle a little olive oil over it and put back for a few minutes under the grill to brown. This is such an iconic nursery recipe it had to be in a collection of family favourites! The very best of British nursery food heritage – And I am not even saying that « tongue in cheek » for it is a true legend as my teenage son’s friends would say. I have yet to know a kid who does not love this and my posse of Franglais for whom I was baking this last week-end gave it a warm reception. Two days before, rinse the cod and put it in a bowl with fresh water. Leave in the fridge and change the water twice if possible. On the day, fill the thermomix bowl up to 1.5 l with water, add the herbs. Insert the steaming basket with the cod inside it and boil for 8 minutes at 90℃. When cooked, drain the water and flake off the cooled flesh, discarding carefully all bones and skin. Put the flesh back into the rinsed bowl with half the milk and pepper. Blitz for 2 min at speed 5. Then proceed as for a mayonnaise by slowly adding half the oil while whisking at speed 5 for as long as it takes to use up all the oil: the cod mixture will become quite smooth and thick. When you have your Mayo consistency, select 60℃ in the temperature buttons and churn at speed 1. Slowly add the rest of the milk and the rest of the oil and cook for about 15minutes, checking the consistency. Stop only when it tastes and looks right! It should look like a smooth purée or dip. In Nîmes, we serve it warm with toast and a green salad or try grilling it topped with grated cheese! This is obviously a family favourite but I’ve never found a better recipe before: this one is as straightforward as it is delicious. The salt cod (or Morue) I used in my brandade recipe came from Copes in Fulham rd, a great shop if you happen to live near Fulham! 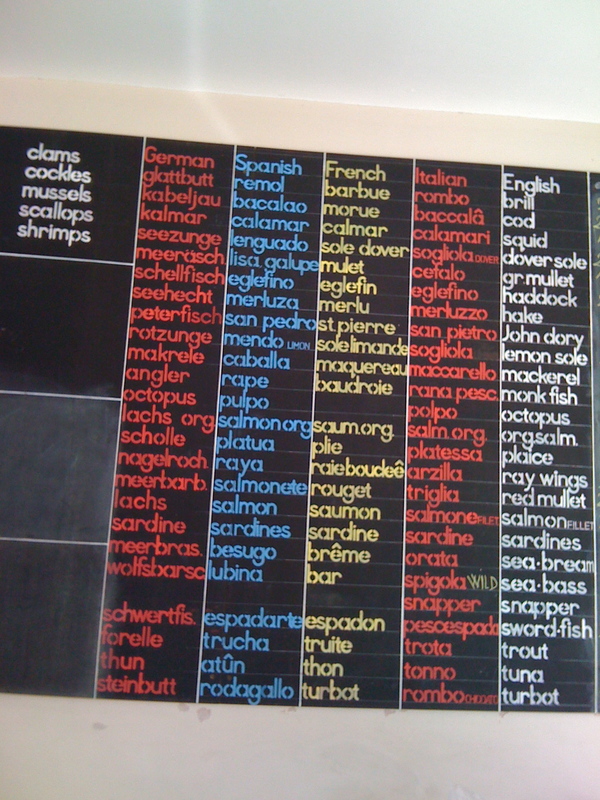 They have a great board up with the names of the fish in 5 languages so you can be creative and never stuck for an idea- even if the recipe was in Spanish!